SHO-ME 07.0200 2-POSITION HORIZONTAL EQUIPMENT RACK. 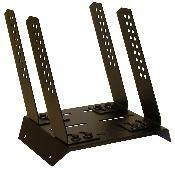 Black powder coated adjustable rack fit in both bucket and bench style, houses your radio, switching systems and numerous other items without interference to the driver or air bag deployment. Dimensions: 9 1/4"H x 8 3/4"W x 7 1/2"L. Made in USA. Copyright © 2017-2019 KARTCO LLC. All rights reserved.